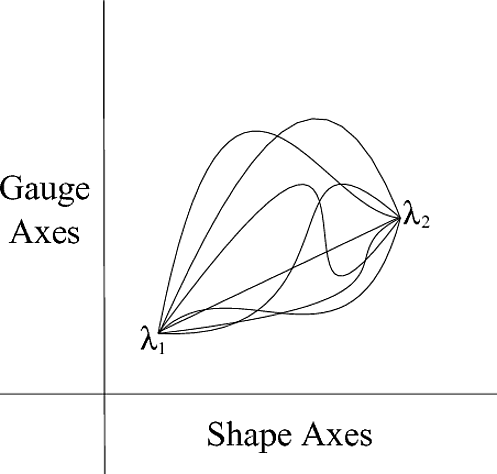 I am attempting to investigate transformations between two distinct sets of vertices on n-dimensional manifolds with a minimal change in the fundamental shape of the vertices. I will give some background so that when my question is asked it will be fully understood, the introductory explanation describes how the metric for configuration space is generated, and then my first question is in regards to computing explicit examples and minimizing my procedure. My second question is in regards to finding constraint conditions for my functional $L$, with the Euler-Lagrange equation, or something else. My main question though, is how to investigate the same type of geodesic equation in configuration space when the manifold is not endowed with a simple Pythagorean metric. 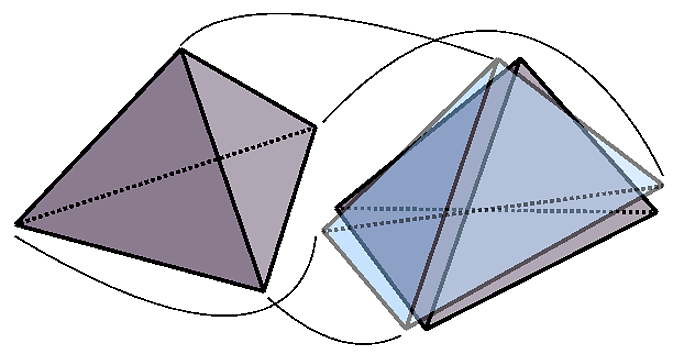 Given an n-dimensional manifold with any metric, I want to find a way to compute the geodesic for a set of $I$-vertices traveling from one position to another. If we then consider these vertices as charges of masses, we have just found a way of minimizing the change in the electric field potential or gravitational field potential given any motion whatsoever. NOTE: Do a quick check of the questions to see if you happen to know the answer right away in order to avoid reading something irrelevant if you are familiar with this type of stuff. Question 1: How would I compute this procedure explicitly with say a $47$-dimensional system of particles? Could someone reference me a paper or give an explanation of how to find a general $n$-dimensional rotation matrix? Everything else seems possible in principle, as Mathematica can likely compute $47$ partial derivatives concurrently. Question 2: How can I, in practice, use the Euler-Lagrange equation to find the constraint conditions for when the functional is stationary? I have tried many different approaches and I just get dauntingly long computations where nothing simplifies. Are there any other methods for finding the constraint conditions for a functional to be stationary? Even if I somehow find constraint conditions, what will they look like and how can I compute an explicit example in say 3-dimensions? For a system of $I$-vertices (with the possibility of being interpreted as charges or masses given the appropriate Lagrangian) in $n$-dimensions, how can a geodesic equation in configuration space be developed to give a comprehensive account of the dynamics of the vertices as they traverse through space defined by the metric of any smooth manifold? That is, I want to know how to generalize some of the procedures explained here for manifolds with metrics other than the standard pythagorean one. My motivation for wanting to know this, is I want to know how black holes interact with the gravitational field potential and electric field potential of charges and masses nearby. Maybe, sometime in the future, experiments can be done on the dynamics of neutron stars interacting closely with black holes. Any responses are really appreciated for those of you who braved the wall of text! Comprehensive explanations of Questions 1 and 2 are required for an accepted answer and any suggestions or references to papers that might relate to part 3 are always welcome. Browse other questions tagged dg.differential-geometry mp.mathematical-physics mg.metric-geometry calculus-of-variations riemannian-geometry or ask your own question. Car movement - differential geometry interpretation. what are the killing vector fields on a triaxial ellipsoid? How the Jacobi metrics may be useful in mechanics with or without constraints? The Yamabe problem and $\phi^4$ scalar field theory?